There is nothing like a juicy slice of watermelon on a hot summer day! No other fruit says summer like the subtly crunchy, thirst quenching watermelon. Not only is the fruit a highly refreshing summer treat, it is also rich in nutrition and water. , the season for watermelon is in the summer when they are sweet and of the best quality. Sale of the fruit is up this summer and vendors expect double the business as compared to last year. Watermelon as a very good source of vitamin B6 and a good source of vitamin B1, C ,magnesium, and potassium.Along with this Vitamin A rich papaya and melon scoops tossed together in rich honey ginger dressing to enhance your immunity. It's a great cooler for warm afternoons. This recipe is wonderful in the summer when it can be made with fresh fruit.Healthy, Super easy and delicious. This recepie I adopted from Tarla dalal.But as usual adding few ingredients I prepared this salad in my own version. Combine all the ingredients in a bowl and mix well. Arrange the scooped fruits in a bowl pour the dressing and toss gently. Refrigerate till chill and serve. nice salad, the honey / ginger must be THE important ingredinets to remember for the final touch :) Enjoy the summer! Thats a delicious fruit salad. You got all my fav fruits in there. 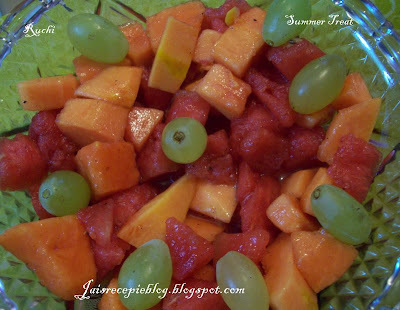 Nice refreshing summer salad..Nice dressing..
Nice post Jaishree! Quite informative about watermelon! When I was a kid,in my parents side,they never ever bought this watermelon even once,can't believe rite? but true!! After marriage only I started eating and love it!! wow thats so refreshing Jaishree. Looks colorful too. That looks yummy and colorful, refreshing one. yummy salad. thx for reminding me of this..haven't had this in years!